One of the most controversial of Charlotte Mason’s principles is how she viewed the teaching of composition. 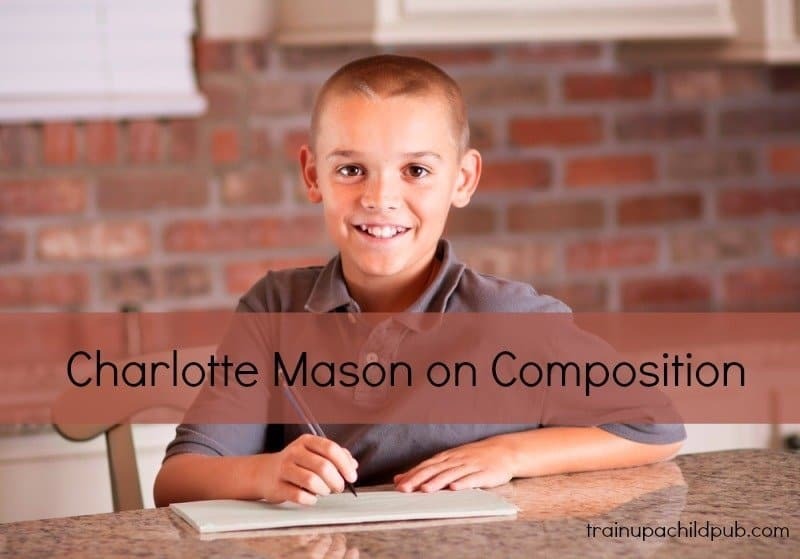 For a unique but fruitful approach – keep reading Charlotte Mason on composition. Under the age of nine, composition should not be taught as a subject. Rather, children should narrate, either orally or in combination with writing, about an experience they have had or on a subject with which they are familiar. Children who have been exposed to the best in literature will automatically be able to express themselves in writing. Punctuation (grammar) should be taught using the books they are reading for examples rather than in isolation. She intimated here and states more clearly elsewhere: Children are to be exposed to superior literature and be allowed to interact with it themselves without us constantly interpreting and explaining it to them. One of the keys to understanding this teaching is that she is discussing younger elementary children, not middle school and high school children. In our curriculum we do not recommend formal composition instruction prior to the age of nine (third grade) – and by that I mean teaching children to write reports, summaries of literature or anything requiring more advanced reasoning skills or even requiring more than a very short paragraph at a time. Some of the popular Charlotte Mason ‘interpreters’ believe Charlotte did not have children do any writing during those earlier years, but she did specifically state in the quote above (from Volume I, The Original Home Schooling Series) that narrations could be all or part in writing, even for children below nine. How Early Should We Teach Writing? Although we don’t believe children are to jump right into school with copious quantities of writing, as more classically oriented curricula often suggest, we do feel there are many skills involved in learning to write and they are more easily learned if they are taught using real books and reinforced through copy work in the earlier years. Some CM purists might disagree. We do keep those lessons very brief and always in conjunction with books written at the child’s comprehension level, but we utilize copy work from first grade on in our Daily Lesson Plans and we include basic punctuation and grammar, as you can see in our 1st Grade Daily Lesson Plans Sample Week from our first grade plans. Although in #2 above Ms. Mason assumes that children exposed to high quality literature will be able to write automatically, I can’t say that has been my experience for all children. Some have definitely been more natural writers than others, in my opinion, and some have benefited by more detailed writing instruction. But not in the first few grades — save it for later elementary. One can’t underestimate what young children learn and absorb through hearing and reading top quality literature, however, we shortchange them if we don’t answer their questions and clarify areas that they obviously do not understand, paying close attention to their attention span and interest level. In Endangered Minds: Why Children Don’t Think And What We Can Do About It , Dr. Healy describes just how important discussion between parents and children is to developing children’s verbal and language skills, and the more conversation, the better. Mind, I am not talking about daily lecturing your primary-aged learners! If your find your children’s eyes glazing over and they suddenly disappear at read-aloud time, consider that you may have crossed the line. This time with literature is to be enjoyed, not analyzed to death. I would love to hear how some of you long-time Charlotte Mason fans have dealt with composition in your home schools. Have you taught writing using traditional CM methods or used another curriculum? At what age did you begin composition instruction? I appreciate your input – it helps all of us! I’d like to chime in on this one, for the simple fact that I have a 19, an 18 and a 15 year old, all of whom read and write very well. This was not always the case. I saw in my middle child the rough and tumble, video game playing, school hating ways that many of my frustrated friends reported in their boys. At the age of 8, my boy very much disliked reading, let alone sitting studiously while the teacher gave writing instruction. My husband suggested that we make video game playing (a very small dose of 1/2 hour a day) a reward for reading for the same amount of time. This decision marked the long, not always fun task of ensuring this lovely child follow through with his reading… often kicking and screaming. 2 years later I got a call from his grade 4 teacher. “We’d like to put your son in a reading program”. Oh-oh. I thought “well, I guess any kid could have a reading problem, I’ll do what’s necessary”. Turns out that reading program was for gifted readers. My son could read at a grade 12 level. His writing followed suit. He’s been an honour student many times over the years and in his final grade can look forward to doing just about anything he wishes. In retrospect, I’d agree with the sentiment here. Having to read every day one can not help but pick up the rhythms and patterns of writing. Ok, so only oral/written narration in elementary. Then on to some writing instruction in middle school – what sort of instruction? using some sort of curriculum? which one? Could someone comment on the specifics of this? I’d love to relax about this subject, but don’t feel very confident to teach writing. IEW is always raved about but seems very expensive and overwhelming to me. What else is there in the writing world? Hi Dawn, thanks for your comment. I understand your insecurity about teaching writing without a solid plan! Our curriculum actually begins gentle writing instruction in third grade through copy work. We begin with understanding words and how they are used to express complete thoughts – i.e., learning how to write complete, interesting sentences. Our writing instruction is similar to IEW in that we teach writing using already published writing, but our method allows for students to develop their own writing ‘voice’ and is less formulaic (and expensive) than IEW. I’m certainly not knocking IEW and realize that it has helped many students, but like any writing program, it has its limitations. Our instruction is based on copy work as well as LOTS of conversation about writing during those earlier years, for example: “Notice the expressive words this author uses!” “Let’s find the verbs in this paragraph.” “Do you see pictures in your mind as you read the author’s description of ___?” This is a very natural method of learning writing and is not stressful for the teacher or the student, as it is very gradual. You might look at our lesson plans samples on our web site for ideas. Feel free to email me dana@tuacp.com of you have any other questions. You’re welcome, Barb. Thanks for sharing what has worked with your boys! I’m looking forward to reading your post on the carnival as well! We started CMs methods later in our school but I naturally avoided most writing programs with my boys just because I am a poor writing teacher. At least I was a poor writing teacher until middle school when we started IEW slowly over the course of three years. Now in high school my boys are confident writers and much of what I see is built up from lots of great literature, varied ideas, and lots of lots of oral/written narration CM style. I am firmly in line with Charlotte Mason and her ideas of waiting for formal writing until middle school. Thanks for putting together this post and sharing it with the CM Carnival. Hey! I just focused on the ‘Peru’ part of your signature! I will have to check out your blog and see what you do there! My college aged daughter spent some time last summer participating in a storying conference with the Yagua people in the jungle, so we have prayed a lot for Peru! I hope you come back and visit again soon! Jimmie, that is very sad for that poor little guy to have to struggle with multi-paragraph assignments at age seven!! I don’t care what curriculum you are using, ladies, please don’t feel as though you need to be a slave to it! Make it fit YOUR children and YOUR family, rather than the other way around. I hope this mom hears advice from other circles that coincides with yours, Jimmie, so that she will lighten up! Thanks for your comment. At a homeschooling conference a mom was asking for help with her seven year old who was struggling to complete his two weekly writing assignments. She didn’t call them essays, but they were multi-paragraph compositions. WHAT? I was aghast. I tried to reassure here that the assignments were not realistic or necessary. But she seemed reluctant to move away from the curriculum’s specific plan. Poor thing, and poor child. Thank you, Lori! You are so right. It is in our nature to compare what our kids are doing to what (we think) everyone else is doing. I’m so happy to have been an encouragement to you. Thanks so much for your comment! LOVE THIS Dana. Thank you so much!! You have eased my mind on this subject. I, like others, I’m sure, are constantly second guessing our choices not to incorporate something into our home school that the public or private schools are doing. What a blessing your posts are!